Well it seems a game that was going to have co-op but now doesn't is still dominating our staff's playtime. Bioshock Infinite is on almost everyone's agenda - but don't worry - there's also a lot of us playing the recently released Defiance and Battleblock Theater. 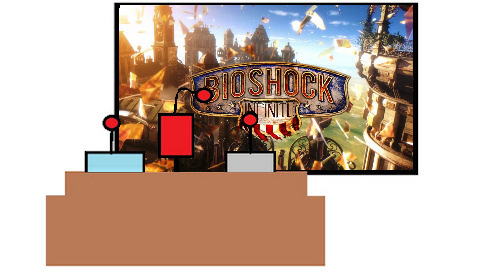 Nick Puleo (@NickPuleo) - "Bioshock Infinite for me. Need to wrap this up so I don't have to keep avoiding spoilers." Andrew Gaskill (@cubninja) - "I'll be starring in BattleBlock Theater, as well as Ark hunting in the terraformed Bay Area of Defiance." Mike Katsufrakis (@Pheriannath) - "I'll be playing a fair bit of Defiance, though Battleblock Theater is calling to me. I've also been playing Luigi's Mansion: Dark Moon with my daughter." Marc Allie (@DjinniMan) - "I'm taking my son to a tabletop gaming convention tomorrow, and we are hoping to get some games of Warmachine and other game demos in while we are there." Jason Love (@JLove55) - "Having wrapped up Bioshock Infinite and discovered that Dumbeldore actually did die in the end, I'll probably be playing more Shattered Haven and hopefully, finally, playing the Netrunner card game." Eric Murphy (@smurph_em)- "Maybe this will be the weekend I convince my wife to play Halo 4 Spartan Ops... Maybe. Otherwise, we might fire up Halo 3 ODST again, and I still need to finish XCOM." Sam Tyler (@reelsamtyler) - "My ending of Bioshock Infinite ended with the Butler doing it (must be the UK version of the game). With that complete, I can now play Halo 4 for the first time - backlogtastic." Locke Vincent (@LockeVincent) - "I have to get on that BattleBlock Theater jam. " Tally Callahan - "Whatever strikes my fancy along with a good dose of LOTR: Living Card Game." Chris Metz (@The_Lemko) - "Everyone seems to be so much father ahead than me in Bioshock Infinite, so I really need to put some time in this weekend. I don't want to be that guy excluded from gameplay discussions!." John Bardinelli (@itsamejohn) - "While everybody else finishes Bioshock Infinite, I'll be the one who's just getting around to starting it. Fashionably late, right? Right."